What can I say about this release? Glorious: This is the one word that can easily and effectively describe Kamelot's latest studio album ''Karma'' - an album that is a logical step forward for the band and also sees Kamelot more unique every year. What do we have here? Truly grand vocals, majestic compositions whole in a regal atmosphere that can touch anyone and everyone. 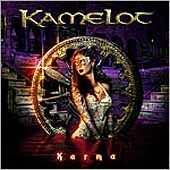 ''Karma'' is the fifth album of the melodic Power Metal band Kamelot. The sound sure is round and soft, with the heavy meaning in a way. Full of symphonic elements (yeah, more than ''The Fourth Legacy'') and keyboard-passages that suit the sound of the Americans. The classical piece ''Regalis Apertura'' opens the 55.55 minutes long album followed by the speedy ''Forever'', destined to be a hit, yet a love song that Norwegian singer Roy Khan wrote about a never-ending relationship to his now once and for all ex-girlfriend. Also, this melody is based on the Norwegian Edward Grieg's ''Solveig's Song'', the composer mostly known for ''In The Hall Of The Mountain King''. Then there's ''Wings Of Despair'', another hit that I believe is one of the first songs written for the album, and also one that could have been included on ''The Fourth Legacy''. Other tracks that will have your jaw dropping to the ground are the masterpiece ''Karma'' and ''The Light Shine On You'', not to forget the absolutely stunning trilogy that ends the record, ''Elizabeth'', which tells the story of the infamous 14th Century East European Countess, Elisabeth Bathory, who was responsible for the death and torture of over 600 victims in her pursuit of eternal youth. But I have to admit that my favorite track of the album is ''The Spell'', very mystical and atmospheric, featuring a killer symphonic break. What you also will notice on ''Karma'', apart from the strong as ever input from Roy Khan, bass player Glenn Barry and marathon drummer Casey Grillo, is that guitar player, and along with Roy Khan the main songwriter, Thomas Youngblood, shines more than ever. The guy simply kicks asses! All in all, ''Karma'' is a very mature effort by Kamelot and showcases the band's ability to write and compose top class melodic Power Metal. So if you are closely watching the quality-level of your Metal, then ''Karma'' is an essential buy. Definitely a MUST have album - and don't tell me any excuses.